Tetris was one of my favorite games as a child. There’s something about making the blocks fall into place in an interlocking fashion that is so satisfying to me. 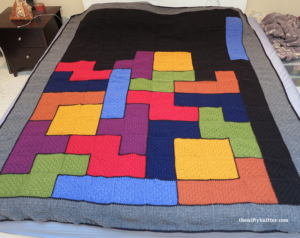 One of the first things I did after learning how to knit was to start designing a Tetris afghan. Five years later, the afghan finally became a reality! 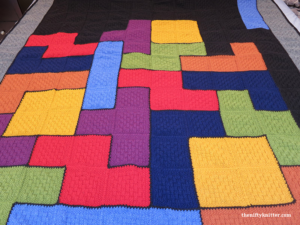 The Tetris Afghan is knit as individual squares, which are then joined together using a crochet join into the Tetris pattern. This makes it a very portable project. I created many of the squares on the plane or in the car while traveling. This is a great beginner blanket. The only knit stitches involved are knit and purl. 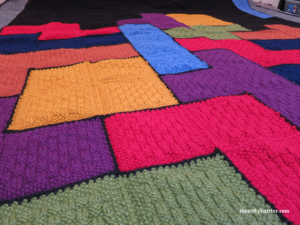 The squares are joined together using crochet with full illustrated instructions for how to do so. This pattern contains two different layouts for the Tetris board. Feel free to design your own layout instead! The finished dimensions are approximately 70″ by 80″ (178 cm by 123 cm). Size 8 US (5.0 mm) needles. Approximately 850-900 yards of grey worsted weight yarn. Approximately 950-1000 yards of black worsted weight yarn. Size US G6 (4.0 mm) crochet hook.